June 5, 2018 - The ISS Expedition 56 prime crew and backup crew including David Saint-Jacques at the last pre-flight press conference. Credit: Roscosmos. Saint-Jacques made two appearances here at the Baikonur Cosmodrome yesterday (June 4) during the rollout of the Soyuz rocket for Expedition 56/57. The rocket is set to launch for the ISS on Wednesday (June 6), and Saint-Jacques is part of the backup crew. Several officials from the CSA came to the rollout to discuss training for his first spaceflight. While there’s no guarantee of a spacewalk, the CSA is making that request for Saint-Jacques, according to Edward Tabarah, head of the Canadian astronaut office. Spacewalking is by no means a new task for Canadians – Chris Hadfield was the first to do so in 2001 – but no Canadian astronaut has done a spacewalk since Dave Williams during STS-118 in 2007. 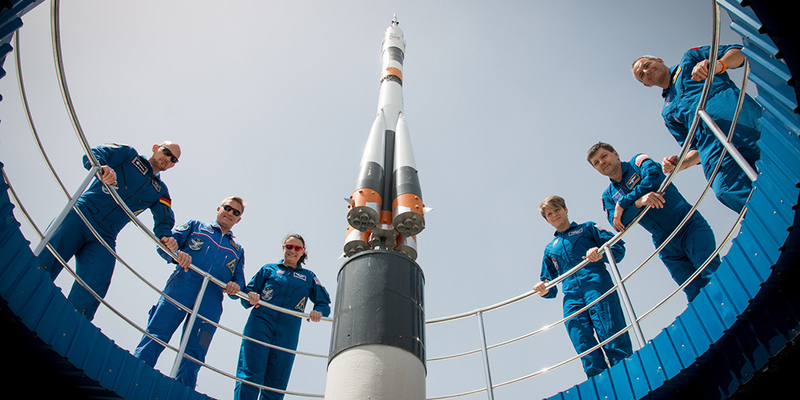 At the Cosmonaut Hotel crew quarters in Baikonur, Kazakhstan, the Expedition 56 prime and backup crew members pose for pictures May 29 flanking a model of a Soyuz rocket. From left to right are the prime crew members, Alexander Gerst of the European Space Agency, Sergey Prokopyev of Roscosmos and Serena Aunon-Chancellor of NASA and their backups, Anne McClain of NASA, Oleg Kononenko of Roscosmos and David Saint-Jacques of the Canadian Space Agency. Aunon-Chancellor, Prokopyev and Gerst will launch June 6 from the Baikonur Cosmodrome in Kazakhstan on the Soyuz MS-09 spacecraft for a six-month mission on the International Space Station. Credit: NASA/Victor Zelentsov. The spacewalk request is just one reflection of Saint-Jacques’ experience, as he has spent nine years waiting for his first spaceflight. In that time, he’s held a range of prominent roles in the NASA astronaut office, such as lead capcom for the Cygnus-3, Cygnus-4 and SpaceX-6 ISS resupply missions. He also has been a capcom instructor. He has waited a while for spaceflight because the CSA has used up much of its banked credits and is now one of the minor partners in the ISS with our astronauts only flying every four to five years. (The last flight was Chris Hadfield, who flew in 2012-2013.) So the agency is looking to make the most of the opportunity. Saint-Jacques is flying the left-hand seat in the Russian Soyuz spacecraft to the ISS, which is a demanding task because it essentially means he is the co-pilot to his Russian commander, Oleg Kononenko. “It’s more responsibility to be a co-pilot because he will take over if the commander couldn’t complete a task,” Tabarah told SpaceQ. Saint-Jacques will also be the backup astronaut for NASA astronaut Nick Hague in October, who is scheduled to fly aboard Expedition 57/58. To date, no Russian backup crew ever had to step in to perform the duties of the prime crew, according to Canadian officials. This means that Saint-Jacques will most likely remain on the ground for Wednesday’s scheduled launch, but his training still peaked so that he’s ready to step into the spacecraft at any moment. Saint-Jacques was selected for this spaceflight in July 2016, giving him 2.5 years to prepare. His other crew members weren’t even selected yet at that time, because the Soyuz co-pilot position requires more training. But in later months, Kononenko and NASA astronaut Anne McClain were asked to join him. Astronauts must pass a demanding set of tests in Russian before being allowed into space on a Soyuz, which includes oral examinations in front of a board of Russian-speaking officials. Saint-Jacques’ crew passed these exams, just like the prime crew. And when Saint-Jacques flies in December, he will essentially be repeating the information he has learned already. But there will be some subtle differences as Saint-Jacques prepares for his flight, according to Tabarah. Experiments are usually one of the last things that are included on a flight, so Saint-Jacques will receive payload-specific training in the next few months. He will also receive more EVA training and a robotics refresher, as the CSA is also hoping to have Saint-Jacques at the control of Canadarm2 for a cargo ship arrival or robotics support during a spacewalk. Saint-Jacques’ preparation for space not only includes technical aspects, but also ensuring that he stays physically and psychologically fit. His medical preparation is being closely monitored by CSA flight surgeon Raffi Kuyumjian. Kuyumjian will go into quarantine with Saint-Jacques in December prior to launch, and he will also be on site when Saint-Jacques lands in Kazakhstan in mid-2018. “It’s important for astronauts to stay fit, because they are exercising [in space] every day for two hours,” Kuyumjian told SpaceQ. He added that the physical fitness is also important for EVAs, because working in a spacesuit for six hours or so is physically challenging. Astronauts even have to fight to grip tools, because pressurized gloves resist the movements of fingers. Isolation is another thing that Saint-Jacques will need to deal with; for about half a year, he will be in space far away from his wife and three small children. But Saint-Jacques has extensive experience in this already, pointed out Kuyumjian. He served on the underwater NEEMO 15 mission in 2011, and the 2013 iteration of an underground mission called CAVES (Cooperative Adventure for Valuing and Exercising human behaviour and performance Skills). Besides extensive joint training to make sure crew members get along and help each other psychologically, Kuyumjian he will have regular psychological conferences every two weeks when Saint-Jacques is in space. These will be private sessions in which Saint-Jacques can discuss any issues, such as work-rest balance. Then Kuyumjian can act as an advocate for Saint-Jacques on the ground, setting up meetings with the NASA flight director or other officials who can make adjustments for Saint-Jacques’ needs. 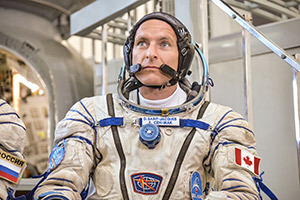 This article is part of SpaceQ’s special ongoing coverage of Canadian Space Agency astronaut David Saint-Jacques as he prepares for, and then embarks on his first mission to space.